Sun in Virgo’s self-effacement will clash with Moon in Leo’s feelings of entitlement. Virgo is usually all about service (and Leo loves to be served) but when he takes the dominant, Sun position, he’ll have less patience for Leo’s significant needs. However, both these signs aim for the best (albeit in different ways) so it’s possible that this attitude will unite them. Sun in Virgo is focused on making things better. His unwavering sense of what’s less than perfect ensures he fine-tunes everything, including his relationship. 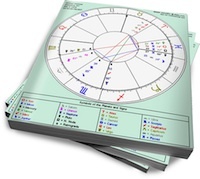 Sun in Virgo is always ready with helpful suggestions on how his partner might do something better, and he won’t be happy with a lover who is unmotivated. Although this sign is not known for losing his temper, the quickest way to annoy him is to slack off or give up. Moon in Leo is the Diva Moon. It doesn’t matter how humble her Sun sign is, eventually her need for attention and adoration will shine through. Her partner should be prepared to offer these things (continuously), but the payback will be Moon in Leo’s solid-gold love and devotion. He’ll know that he’s been allowing his end of things to slip (his Diva is feeling ignored) if she becomes ultra-moody and dramatic. Sun in Virgo will initially try to give Leo what she needs, but will quickly become overwhelmed by her demands. Moon in Leo will love that Virgo helps her, but will feel let down when she realizes he gives practical assistance, rather than romantic gifts (or bold statements of love). Sun in Virgo will become impatient with (what he views as) Leo’s self-indulgence, and Moon in Leo will feel hurt. A shift in perspective will be required by both. If Virgo can see that Leo simply wants the best, and Leo can see that Virgo is doing his best to provide that, these two may be able to find some common ground.